The Occasional Birder: An Arctic Rarity! So this is a rather special post, but before we get to the real excitement, I took this nice photo of a Raven making a racket on top of North Light yesterday, just after I found my first BBRC rarity!! An Arctic Warbler! Keep an out next October, I'll be getting my name published in the annual report (hopefully!). This stunning little bird was flitting around Kirn O'skroo on the north of the island! 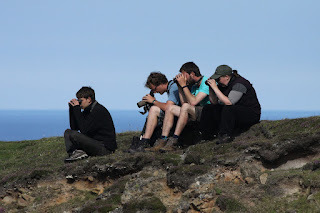 I knew it was either an Arctic or Greenish Warbler, but on return a few hours later with a small army of experienced birders it was confirmed as the Arctic Warbler, Fair Isles' 80th record and only the second bird in the UK this year! This bird breeds right up in the northernmost forests of Scandanavia (Fennoscandia) and Russia and winters in SE Asia; meaning it has one of the longest migration routes of any Old World insectivorous birds. Some of the assembled birders. Joe, Me, Jason and Becky. I also got another treat yesterday morning when Jason caught a Common Rosefinch in one of the heligoland traps. This was the first time I'd seen one of these nice little birds anywhere near close and was a nice start to the morning, on a day which also produced a Little Gull at South Light and a nice flock of 20 Whimbrel that flew past us while we were on the cliffs.